The Predator takes place on Halloween. This tells you everything you need to know about the picture's intentions. It's goofy, campy and hyper-violent. Generic gmen and nameless scientists scurry about to find out what threat the Predators pose after they land in Suburbia, USA. The film is an extended, irreverent riff on 1950s creature features, with the benefit of a major budget and studio backing. Because of this tongue-in-cheek tone, any plot point or joke that falls flat can be dismissed as parody. It's a clever trick by clever screenwriters, Shane Black and Fred Dekker. Black also directs the film, and starred in the 1987 original. 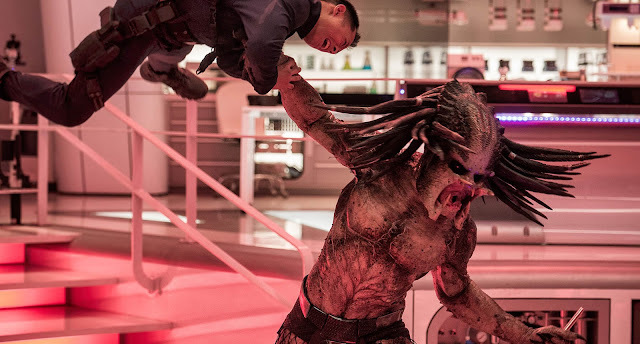 Throughout the film a regular size predator is hunted down by one of the ultra-size predators from 2010's Predators. It seems the predator war from that entry is still ongoing. Carnage ensues. Caught in the middle are a group of soldiers who would seem more at home in a mental asylum than a combat zone. Led by Quinn McKenna (Boyd Holbrook), they have all committed some crime against the government. Their witty interplay and dialog comprises many of the film's highlights. Olivia Munn joins the boys as a scientist who is in far over her head. Alan Silvestri's original Predator score is heavily used throughout the proceedings. If only The Predator composer Henry Jackman incorporated a theremin, the 1950s schlock would be complete. Visually the film is . The cinematography and pacing are effective for this type of film. The low-light photography during the "barn sequence" is particularly striking. While there is much sci-fi action fun to be found, the film is thoroughly amoral. Predators kill predators and humans kill humans, with every variation in between. It's a kill or be killed picture, and people kill. Some characters like to kill, and other kills are played for laughs. McKenna's son kills a neighborhood bully while trick-or-treating in predator armor. Life has little value here, which perhaps encapsulates the most modern ethos of the film. The film is loud, bombastic, stupid... and fun. Your enjoyment of the film will vary based upon your tolerance for these attributes.